In Washington, D.C., a cell of Afghan terrorists—armed with a nuclear weapon—conspire to rob the Federal Reserve Bank of New York of 18 billion dollars. The money is intended to fund Mohammed of Babylon, who is the prophesied redeemer of Islam. Mohammed, however, is a man of peace and must find a way to rectify the wrong done to the United States without angering his followers. In the meantime, a federal investigation into the attack uncovers a frightening plot by an international corporation to fund and manufacture global terrorism, leaving the feds wondering what it will take to counter the terrorism already set in motion. 1. Tell us about your new book, 18 Billion. 18 Billion is the story of a nuclear threat against the United States by Afghan immigrants, who are Muslim. They plan to use the threat to rob the New York Federal Reserve Bank of its cash reserves and send that money to a Mohammed of Babylon, whom they believe to be the Mahdi. Mohammed, who is a proclaimed “man of peace” wants no part of terrorist activity and after receiving the money, seeks to return it to the United States without betraying the trust of his fellow Muslims. There is also the underlying plot of an international terrorist group that requires interdiction at multiple sites around the world, involving agencies of the United States government. At the end, Mohammed finds that he has used means of terror to combat terror. It leaves him in a quandary that he must somehow resolve by choosing one of two doors before him in the fulfilling of his life’s purpose. 2. What inspired you to write 18 Billion? Islamic jihadists are a fact of life now as never before in American history. The book brings that home with a driving force. Yet, I am convinced that there are Muslims of noble character who are torn between allegiance to their faith and wanting to hold on to certain moral convictions not espoused by their kindred. This, among other things became a phenomenon to explore. 3. What message do you want readers to take away from your book? 4. What sort of research went into writing this international thriller? Primarily internet research of the banking industry, branches of government (both domestic and foreign), and media reports of terrorist incidents. 5. What is your process for planning out characters and events in your novels? I primarily plan and document action scenes that will flow with the story; I then create characters that fit into these scenes. Many characters come from my own imagination; some characters are inspired (not portrayed) by people I have known and worked with over my lifetime. Into this flow, I often interject ancillary events and statements that are not necessarily associated with the story, but elaborate on a theme projected by the story. 6. Why did you choose 18 billion as the amount of money to be stolen from the United States Federal Reserve? 7. How did you create the characters in your book? Are any of them based on people you know or have read about? The characters are completely fictional. I have not based any of them on people I have known in the past or now know. They simply evolved out of the machinations of my mind. Don’t ask me how that works. 8. You mentioned that writing is your third life career, after being a pilot in the United States Air Force and an orthopedic surgeon. Was writing always an interest of yours or did it only come about after retirement? I have, for as long as I can remember, been one to write down thoughts and experiences. I never thought of writing as a career or even for publication until recently, although the germinal seeds for this book surfaced in my life during my five-year stay in Saudi Arabia, 1980-85. 9. How did your experience in the military and on medical mission trips affect your view of the world, and consequently, the plot of this book? Early on in my travels, meeting people of many cultures and nationalities, I learned there was a commonality in us all. It is this – The basic need for everyone is to love and be loved. Piled on top of that are all the whims, fancies, and enslaving emotions of our striving lives. Possibilities and choices are always with everyone and how we manage them defines who we are. The characters in my book uphold this conviction. My experiences strengthened my faith in God, and at the same time engendered in me a certain degree of skepticism on those who sit in places of power over other people. 10. What tips can you give aspiring writers looking to create compelling fiction using real events? Be careful to not portray a character of fiction as you might actually know someone to be. Do not be in a hurry to abandon a character in the heights of success or the throes of despair. Do not lose sight of the fact that what you are portraying must lie within the realm of possibilities. 11. In 18 Billion, the president complies with terrorist demands to ensure the safety of Americans. Do you think that we should ever negotiate with terrorists? I am not a terrorist expert. I believe though that every terrorist demand must be managed on its individual circumstances. There is no ‘cookbook’ on which we should rely. 12. The issues of border security and terrorism are raised in the book. Do you think America is still as vulnerable to terrorist attacks as they were before September 11, 2001? 13. I know you’ve said you believe that the Middle East will be pivotal to events surrounding the “end of the age” as described in Bible. Can you explain this? 14. Where can we purchase a copy of 18 Billion? Online at www.jackgresham.com if you want an autographed copy, as well as Amazon.com and all other major booksellers. 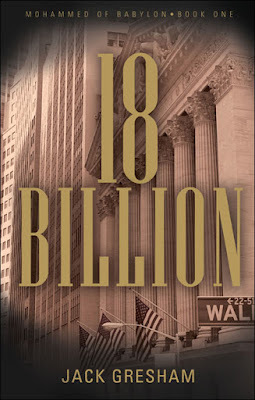 Thank you to Maia Levenson of Phenix & Phenix Literary Publicists for sending me a copy of 18 Billion to review.